Satisfy your sweet tooth guilt free with these easy 5-Minute Healthy MANGO YOGURT POPSICLES! Four ingredients and five minutes is all you need. Mix 1 Tbsp Maple Syrup to 1 Cup of Mango Puree until well combined. To 1 Cup of Greek Yogurt, add the remaining maple syrup, vanilla essence and stir well until mixed well. I just went with the flow. For one of the mould's, I started with a layer of yogurt followed by mango and then yogurt again. So just enjoy making the whole thing in your way. Freeze the popsicles for atleast 8 hours. To unmould them, just run the mould through tepid water for 15 seconds and pull the stick out. 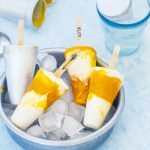 Enjoy these Mango Yogurt Ripple Popsicles guilt free.